Our removal guide shows how victims can delete WinBan Ransomware infections and restore their computers and data from the virus. How Does WinBan Ransomware Infiltrate the System? The security researchers who discovered the initial WinBan Ransomware malware samples report that it probably originates from Romania. It targets computer users worldwide and uses different strategies to spread. The hackers create email spam messages crafted in a way that confuses the users into infecting themselves with the virus. Depending on the initiated attack wave it may either be attached directly or linked in the body. Another method that is frequently employed by criminals is the use of infected payloads. They deliver the WinBan ransomware in software installers and office documents as scripts. When the user interacts with them a command is executed that downloads the threat from a remote server. This type of infections cannot be effectively detected by some anti-virus products, this is the reason why we recommend that all users use a quality anti-spyware solution. Criminals create download portals, malicious web scripts and ad networks that can infect victims with the WinBan virus. Browser hijackers and their use can also lead to the deployment of the ransomware code. 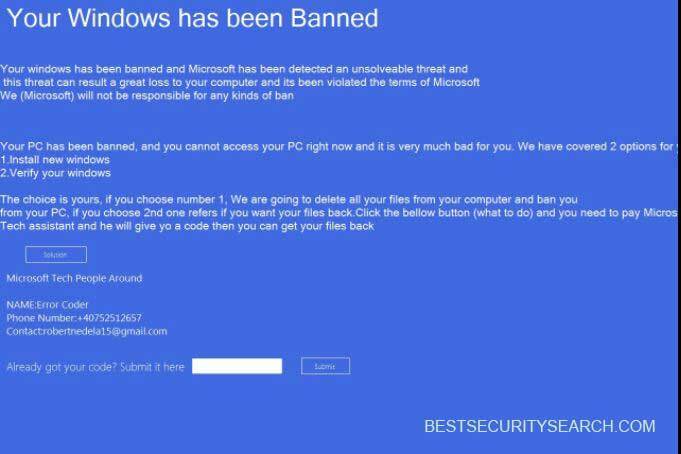 WinBan Ransomware is a newly discovered ransomware that seems to be made by its creators. The initial analysis does not show any similarity between its engine and any of the popular malware families. At the moment the captured samples do not encrypt any files in comparison to other similar threats. It is customary for viruses like this one to encrypt all available data based on a predefined list of target file type exetnsiions. Tech assistant and he will give yo a code then you can get your files back. The computer criminals use a well-known trick that attempts to persuade the victims that the lockscreen is deliberately made by Microsoft. WARNING! Manual removal of WinBan Ransomware requires being familiar with system files and registries. Removing important data accidentally can lead to permanent system damage. If you don’t feel comfortable with manual instructions, download a powerful anti-malware tool that will scan your system for malware and clean it safely for you. WARNING! All files and objects associated with WinBan Ransomware should be removed from the infected PC before any data recovery attempts. 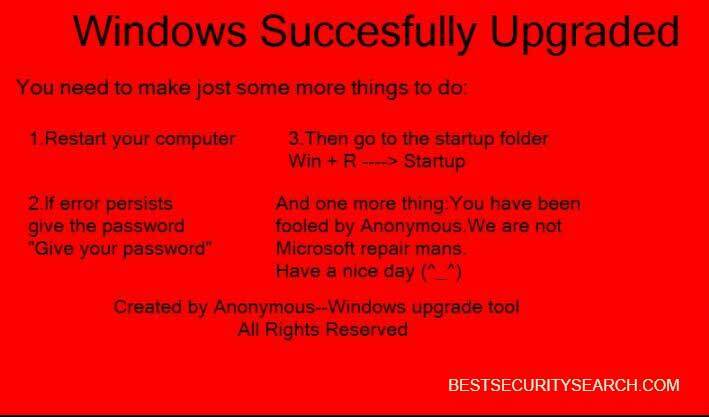 Otherwise the virus may encrypt restored files. Furthermore, a backup of all encrypted files stored on external media is highly recommendable.